September 10, 2015: How partners from totally different sectors manage to collaborate with WorldLoop to change the e-waste cycle? For example, what does a Burundian e-waste recycling entrepreneur, a large consulting firm, an IT leasing company have in common? Not much unless you bring together the core businesses of all three through a socially responsible collaboration with international not-for-profit WorldLoop. Deloitte Belgium, a strategic partner of WorldLoop, upgraded their employee’s smartphones to iPhones at the end of 2014 to facilitate stronger collaboration and access information. As a company, they found leasing a sustainable solution to ownership and contracted with CHG-MERIDIAN to roll-out new phones internally. As a leading service firm, beyond compliance leadership and taking up environmental and social responsibility globally is very important to Deloitte. Because of this, the company decided that for every new iPhone issued to a Deloitte employee, a contribution would be made to WorldLoop, supporting the collection and environmentally sound treatment of mobile phones in Burundi. In other words, Deloitte’s internal roll-out helps ensure that more than 20,000 smartphones are spared from a landfill in Burundi and are recycled in the best possible conditions by local social entrepreneurs and international treatment facilities. 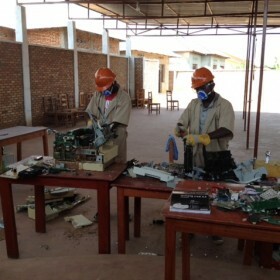 Burundi, the small landlocked country nestled between Tanzania to the east, Lake Tanganyika and DRC to the west and Rwanda due north, has been actively addressing its e-waste situation for a number of years now. While overall volumes of e-waste are lower in Burundi, when compared to countries like Nigeria, the commitment of local entrepreneurs to sustainably treat their e-waste is strong. WorldLoop congratulates its local partners for reaching their first collection target of 30 tonnes this year. Protective equipment reduces injuries and exposure risks.